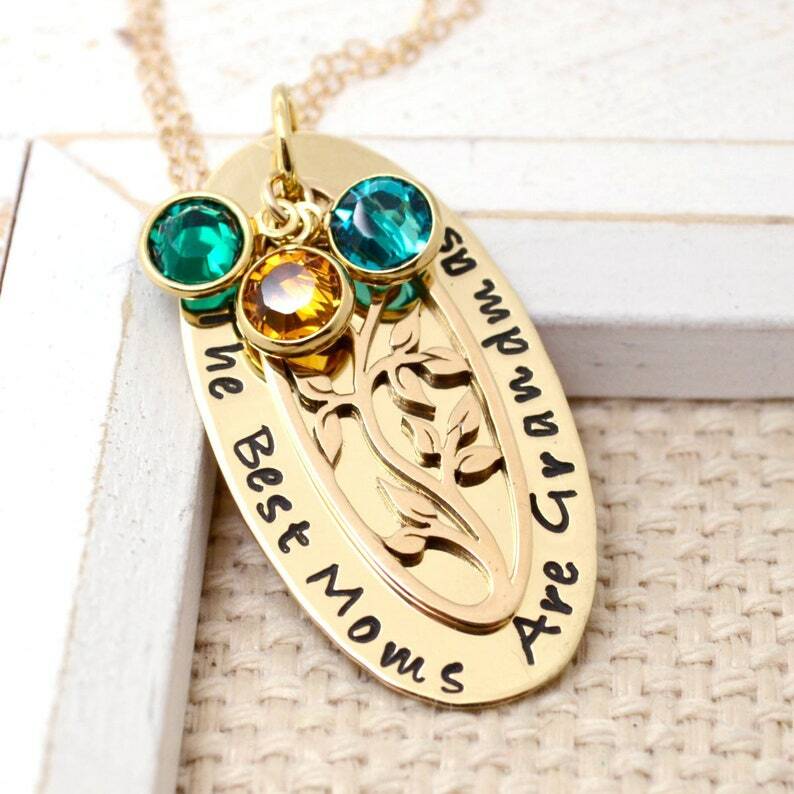 Show your mother or grandmother your love with this stunning necklace - This Is Our Family. * Brass Disc (20 Gauge 38mm x 20mm) with names stamped on the outer edge. Your necklace will arrive in a jewelry box decorated with a ribbon ready for gifting. Also included is a complimentary polishing cloth. PLEASE NOTE: Each piece is handmade just for you. Sometimes letters may not always be perfectly aligned and some letters may strike deeper than others. Each piece will be unique and you should expect variations. No two pieces will be alike. This makes your jewelry uniquely yours and gives it character. It is not considered a defect. Please send me a message via the Conversation link if you have any questions. Special offer details: Not applicable to previous orders. Thank you so much! I love my bracelet and my family feels much better with me having it on! thank you! It is a very nice gift. Arrived fast and seems sturdy. Production times vary depending on the time of year and sales volume. Typically turn around on orders is a little over a week (5-7 business days (M-F)) however during busy season such as Mother's Day and Christmas they can go up to 3 weeks. Current production times are posted in each of the listings. Production time does not include shipping time. If you need your items sooner Rush options are available or please contact me prior to placing your order to make sure I can accommodate your deadline. Typically: 1st class can take up to 5 business days for delivery, Priority Mail 2 to 3 business days, Express mail takes 1 to 2 business days. International shipping varies by country and cannot be guaranteed. What will be stamped on the item? Stamping will be done as instructed in your order. If you select an UPPERCASE font only stamping will be uppercase only even if your note includes upper and lowercase letters. Please separate names with a comma. Please make sure all information is correct prior to submitting your order. I do not offer remakes due to incorrect information provided in the order. Not all fonts will work with all of the designs. If your selected font and numbers or letters will not work for a specific piece I will contact you and provide suggestions and alternatives. Some fonts are only lowercase or UPPERCASE, and some do not include numbers. If the stamping request includes numbers and you selected font without numbers I will use those that match the font as much as possible or contact you. Some fonts like Royal and 6mm fonts are suitable for initials only. What chains and birhtstones do you offer? 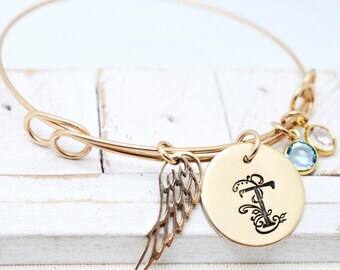 How do I care for my personalized jewelry? All metal tarnishes over time, some faster than others. To slow the tarnishing process store your jewelry in a dry place in closed bag. Avoid leaving your jewelry in humid areas like bathrooms and pools. Avoid contact with chemicals. Keep your jewelry away from extreme heat or sunlight. Remove your jewelry when cleaning, showering (keep it dry!! ), or swimming in a pool. Brass may cause discoloration on skin for some people. I use a protective coating on brass pieces where it touches the skin to prevent this but it does wear off over time. I included polishing cloth with orders. All orders come gift wrapped and ready for gifting. Most items come packaged in a jewelry box with a satin ribbon. Items for women come in a brown box with a pink ribbon, items for men are packaged in cream and brown box and brown satin ribbon. If I am unsure of the recipient I will package the item using brown ribbon. Larger items such keychains or ornaments will be packaged in a velvet or linen jewelry bag. Personalized and custom orders are non-refundable unless there is an error that was made by me. If such case I will re-make the piece immediately. Please note, I will not refund orders because of font choice. If you have any questions or would like to make modifications to the listing please contact me PRIOR to placing your order to avoid any misunderstandings. If I am unclear in the information you provided at checkout I will contact you. CHAINS and Bracelet straps can be replaced ONLY if defective (broken at a clasp). Defect must be reported within 5 days receipt of the order. Please contact me in such case. Defective chains/straps must be returned for exchange. Orders are not insured, but insurance is available to you at extra cost. Typical insurance cost ranges from $1.50 to $5.00 for purchases under $100. Priority and Express Packages include insurance (up to $50 for priority, up to $100 Express) . If you would like to add insurance to your order (or add additional to priority or express) please let me know and I will provide exact price and set up a listing for you. PLEASE NOTE: I am not responsible for any damage, delay or loss caused by postal office or any shipping company. Yes, I love to design special and unique pieces for my customers. If you have something specific in mind or if there is a design you like but would like to make changes (aside from personalization) please contact me prior to placing an order. I look forward creating one of the kind piece for you.